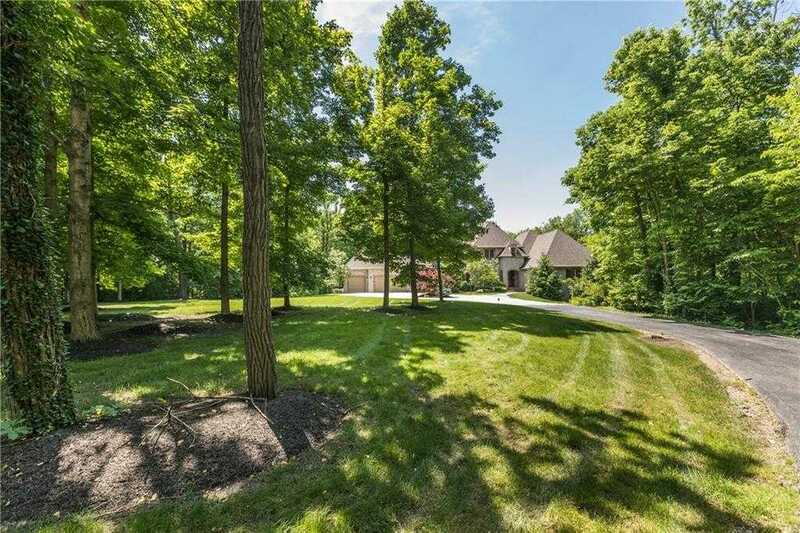 Stunning French Country Estate on 6 wooded acres in Zionsville with distinctive finishes throughout. Hardwood floors, beamed ceilings dual staircases, elevator & 2 fireplaces. Kitchen with custom alder wood cabinets, double ovens & warming drawer opens to a beautiful eating area with custom built-in butler’s cabinet. Master suite and private guest suite both on the main level with 3 bedrooms, 2 baths and 2 loft areas on the upper level. Walk-out basement with wet bar, family room, game room, billiard area and exercise room. High efficiency geothermal heat. Outdoors features a fenced in backyard, cedar barn with concrete floor and loft, 80′ x 60′ sport barn, gated entrance, and circular drive. Convenient commute to downtown or the airport.